It’s no secret that opening a restaurant requires a herculean effort. There are kitchens to build, licenses to file for, linens to buy, recipes to test. It easily can take a year—and that’s barring any disasters. Last March, Eric Donnelly and Christy Donnelly, owners of cult fave seafood eatery RockCreek, had already pushed back the opening date of their new restaurant, FlintCreek Cattle Co. The restaurant’s 1910 space, a former furniture store on the corner of Greenwood Avenue N and N 85th Street, required an extensive seismic retrofitting. And then, when they were nearly ready to open, the March 9, 2016 Greenwood explosion leveled three neighboring businesses. The doors finally opened last October, and with one look, you can see what the fuss was about: Original lath-and-plaster ceilings have been abandoned in favor of exposed beams from which hang modern, multi-globed chandeliers; the mezzanine, which runs only half the width of the dining room, features beautiful original wood flooring. It’s a dining room that manages to harness the space’s history while still feeling current and stylish. Fans of Donnelly’s approach to seafood at RockCreek will appreciate that the same kind of finesse without fussiness is applied here to lesser known, more sustainable, leaner varieties of proteins. Although you’ll find a rib-eye and filet mignon under “chops” at the bottom of the menu, FlintCreek is most definitely not a steak house. And you’d be doing yourself a disservice to not sample the bison, venison, lamb and duck. But first, let go of any negative associations with game meat (perhaps you’ve had Uncle Joe’s cooking after one of his deer-hunting expeditions? )—Donnelly knows what he’s doing. The small plates and appetizers range from light and produce forward (try the crisp pickled veggies with blue cheese tahini, $11) to more substantial, such as the house-made lamb sausage with marjoram and smoky fingerling potatoes in a pool of luxurious Raclette fonduta and with a truffle-accented slaw ($12). Braised Flintstone-size bison short ribs ($29) are so tender, a knife isn’t needed; the meat and its rich, savory sauce benefit from the zing of pickled mushrooms. 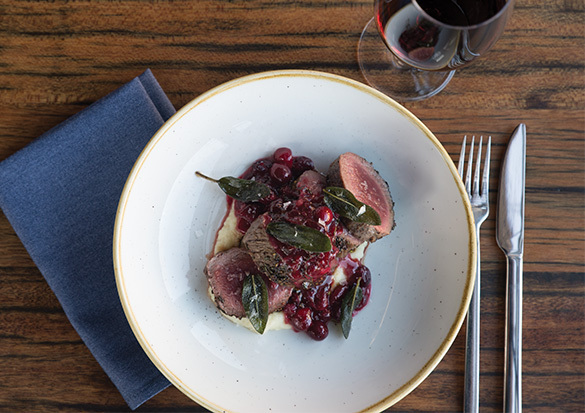 Heavily peppercorn-crusted venison ($28) is cooked medium rare; its pairings of parsnip purée and cranberry gastrique are reminiscent of Thanksgiving dinner. Greenwood is still very much a neighborhood that’s healing. Thankfully, FlintCreek is there to provide the comfort food. Flintcreek Cattle Co.